Garage Sale Oval Mirror to Fall Pumpkin Welcome Sign! My fall project today starts with this plastic or resin antique gold oval mirror with raised detail. I paid $2. First, I cleaned the mirror and frame and brushed on two coats of Deco Art Americana Chalky Paint in Heritage . Next, I added a taller gold lamp finial to the top of the frame with a screw. I got the lamp finial free. This is my project so far. I wanted the detail to really pop on my frame so I then brushed on Rust-Oleum Chalked Glaze . This is a brush on and wipe off glaze. The more you put on and the longer you leave it on the darker it gets. I also put the glaze on the finial to turn it from gold to a bronze color. After finishing up my painting and glazing of the frame, I brushed on two coats of Annie Sloan Chalk Paint in Graphite. The chalk paint sticks to the mirror and is a little lighter than actual chalkboard paint. More of a charcoal than black. I sanded the graphite paint very lightly with 220 grit sandpaper to even out the chalkboard look surface. I purchased this stencil from Hobby Lobby. 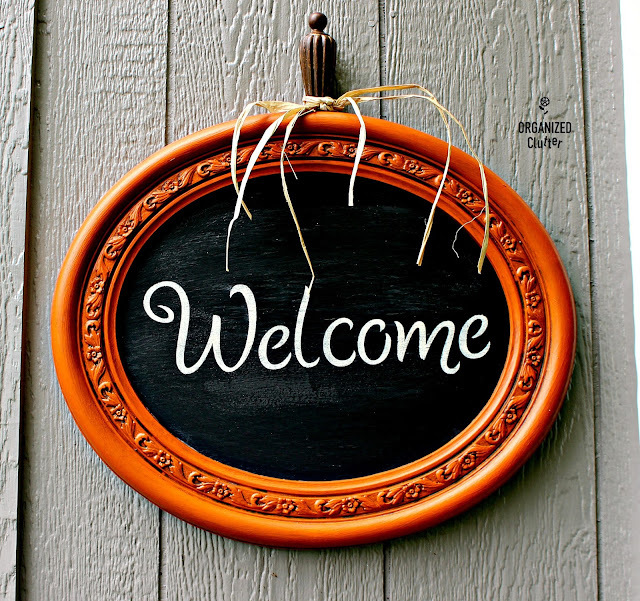 I stenciled on "welcome" with Ceramcoat Acrylic Paint in Light Ivory with my Dreamweaver Brush Set . The last step was to tie three strands of raffia to the finial and hang up my pumpkin! Well now, isn't that a great idea! 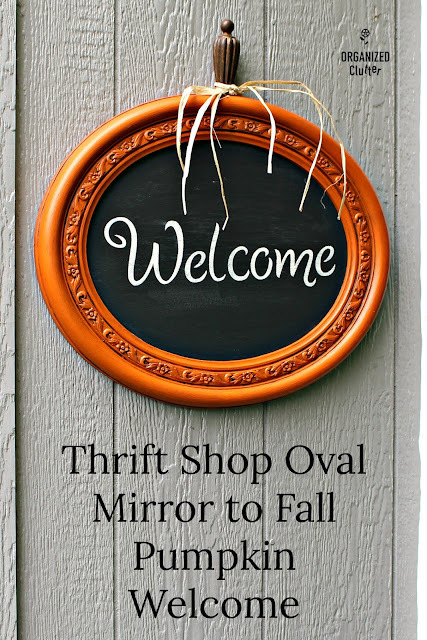 Your thrift store mirror looks wonderful! This is so stinkin' cute and creative! I love what you did! Wow, just wow! You and your talent never cease to amaze me. So very cute! I love all your clever up-cycles......thank you for sharing! How clever, and I love the paint color. What a smart idea. Way to upcycle a cheap garage sale find. Wow, this turned out great, love it!! I love it, it's fab! What a great $2 find. Looks great what you did with it.